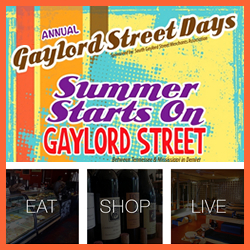 The Gaylord Street Days event celebration takes place in Denver Colorado in May. Join in the fun at this Old South Gaylord Street neighborhood community event. Featuring artisan vendors, fun kids activities and play zone, great local food and beverages, performance artistry, yoga, and of course, sunset cocktails! Have a great time at this Denver Colorado event on the Memorial Day Holiday weekend. A whole BLOCK of fun and remember to – EAT SHOP LIVE South Gaylord!